These Baked Crispy Cajun Chicken Wings are super crispy on the outside, and tender on the inside. Rubbed with Cajun seasonings and tossed in a sweet n’ spicy glaze, these wings are packed with flavor! With half the fat, yet ALL the crispy, delicious flavor, these wings NEED to be part of your football line up! Hi there, friends! How was your weekend? Was it everything a weekend should be? You know, straight up glorious, and filled with laughter, relaxation and epic eats? Our weekend was… a much needed break from “real” life. If you visited this blog last Thursday, you know I have been having a very rough few days. I’d love to report that all that repugnant nonsense  was a thing of the past, but unfortunately our problem isn’t one you can just sweep under the rug. Although I can’t discuss the details, and I wouldn’t want to bore you with them anyways, I DO want to say THANK YOU! To the friends closest to me, and all you lovely readers who left kind comments, thank you SO very much! You guys lift my spirits more than you could possibly ever know. Anyways, I’ll stop with the all the mushy feels and jump right into today’s recipe – WINGS! YAHHHHS!!! With the Super Bowl this weekend, I just HAD to make you guys some wings. I mean, it just seemed like the American thing to do. Since these wings have remained a favorite of Boy and I’s over the years, I decided that they absolutely NEEDED to be plucked from the archives and given a brand, spankin’ new makeover. These wings are crispy on the outside and succulent n’ tender on the inside. 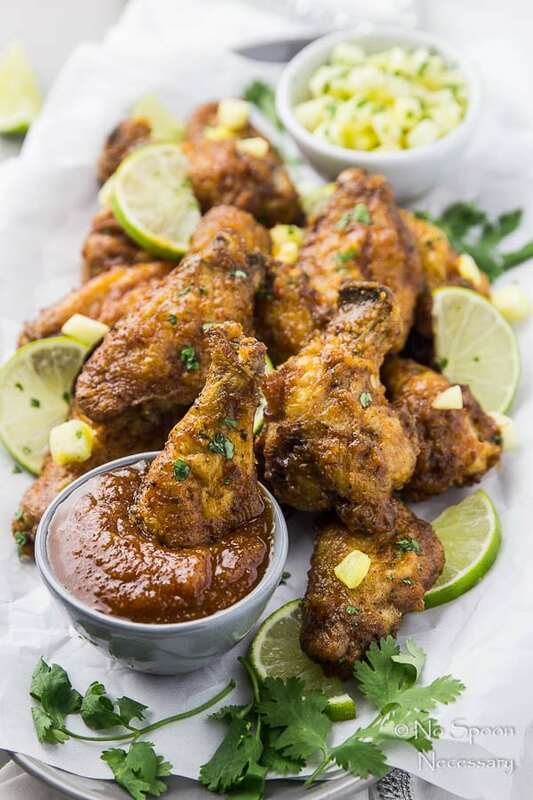 Rubbed with a mix of savory-piquant Cajun seasonings and coated in a spicy, sweet and smoky glaze, these chicken wings are straight up GLORIOUS. 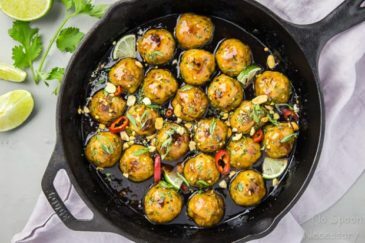 Like, these bad boys WILL knock your socks off, so do yourself a solid and eat these in your bare feet… you wouldn’t want your stinky socks to land in someone’s lap. Bonus, since these wings are BAKED and not fried, you can devour at LEAST twice the amount. 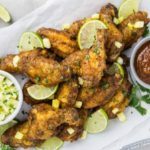 How to Make Baked Crispy Chicken Wings? Adjust your oven racks to the bottom and top third position and pre-heat that sucker to 250 degrees. Use paper towels to THOROUGHLY pat the chicken wings dry and add place them in a large Ziploc bag for easy clean up. Toss in the cajun seasoning and the baking powder. Shake, shake, shake to evenly coat the wings. While the wings are baking, whip up the glaze. There are a few ways to do this, which I highlighted in the notes below (#5). But basically, just roughly chop some pineapple, a few chipotles and an onion. Add them to a small saucepan along with the other glaze ingredients, bring to a boil, and then reduce to a simmer. Cook for a beat, until all the glaze is slightly reduced and thickened. Puree and set aside. 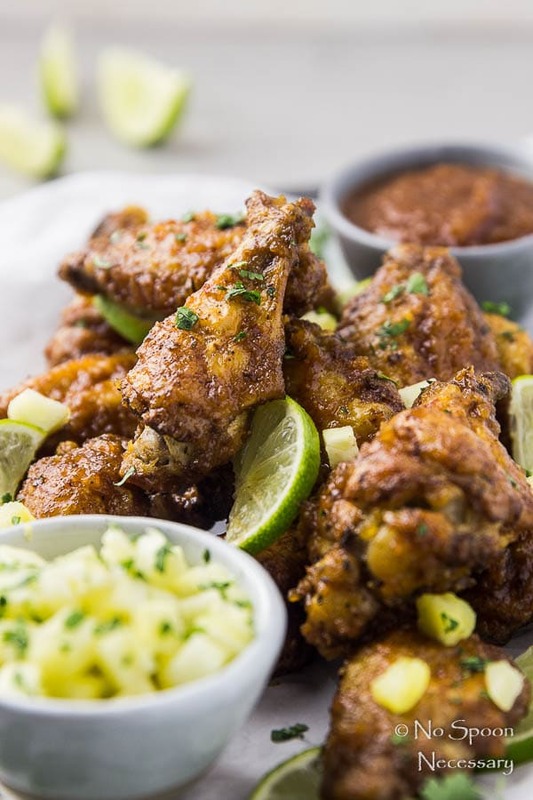 When the wings are golden brown, crispy and delicious, toss the Baked Crispy Cajun Chicken Wings with the glaze and garnish with desired toppings. Bust out the wet naps and get yo’ grub on. You can purchase your wings already cut into drumettes and flats, or you can cut them yourself. It’s really easy! Check out the picture at the beginning of this post to see exactly where to cut (you will discard the wing tip). OR you can make these leaving the wings completely intact – drumette, flat and wing tip all connected. 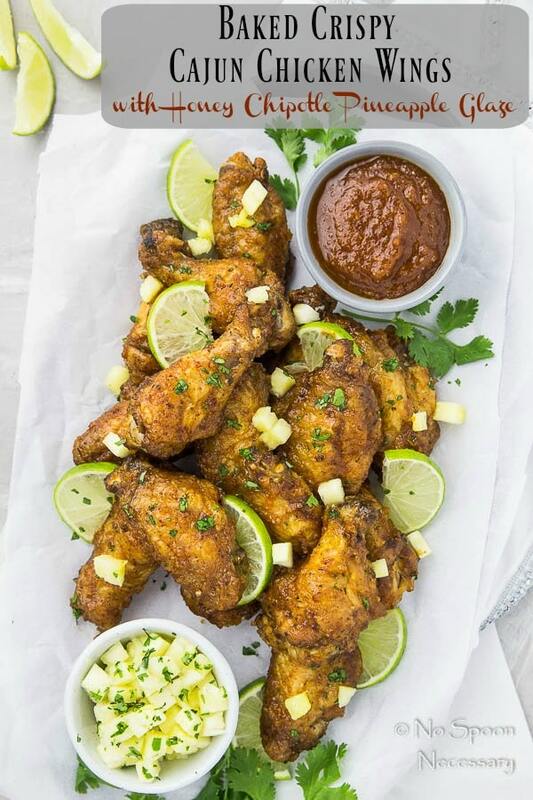 To ensure CRISPY wings, there are THREE steps you should NOT skip – drying the wings THOROUGHLY, coating them EVENLY in the seasoning/baking powder mixture, and baking them on a RACK insert. Do those three things and you are golden. When baking the wings, do not be alarmed if there is a bit of smoke in the oven. Wings have a good amount of fat, and as these bake, the fat will be rendered out and create smoke. Don’t freak out. You can either purchase Cajun seasoning or make your own. I highly recommend making your own spice mix. Not only is it really easy, you also probably already have all the spices in your cabinet. AND since you are controlling the amount of salt, you can skip adding salt to the wings in the first step. I have included the recipe to make your own Cajun seasoning in the notes section of the recipe below. IF you choose to buy your Cajun seasoning, TASTE IT. Use your discretion as to how much salt to add to the wings. There are a few ways you can make the glaze. 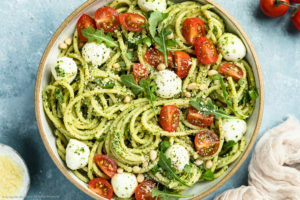 If you don’t have an immersion blender, but do have a food processor, I recommend you puree all the ingredients together in the processor first, and then cook the glaze. This way you can avoid transferring the glaze to a stand blender after it is cooked. If you do have an immersion blender, just follow the recipe as instructed. The same goes if you don’t have an immersion blender or a food processor, as you will just puree the glaze using a stand blender. The glaze can be made up to 3 days in advance. Be sure to let it sit at room temperature to remove the chill while the wings are baking. 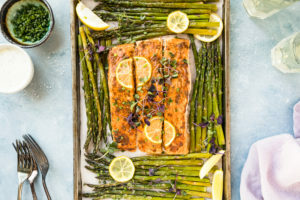 You can substitute dried seasonings for some of the fresh ingredients in the glaze, so be sure to check out the notes section of the recipe! 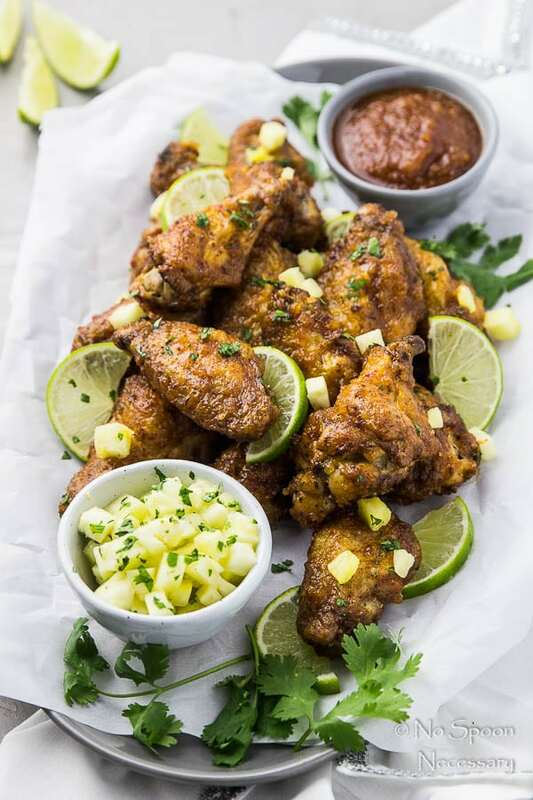 Whether you watch the BIG game, or just partake for the food, add these Baked Crispy Cajun Chicken Wings to your Super Bowl line up! Until Thursday friends, cheers – to glorious game day grub. 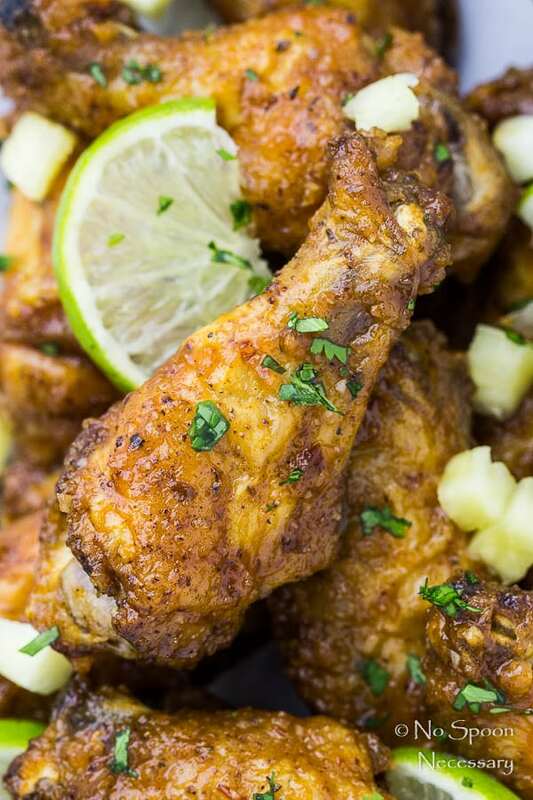 These Baked Crispy Cajun Chicken Wings are super crispy on the outside, and tender on the inside. Rubbed with Cajun seasonings and tossed in a sweet n' spicy glaze, these wings are packed with flavor! 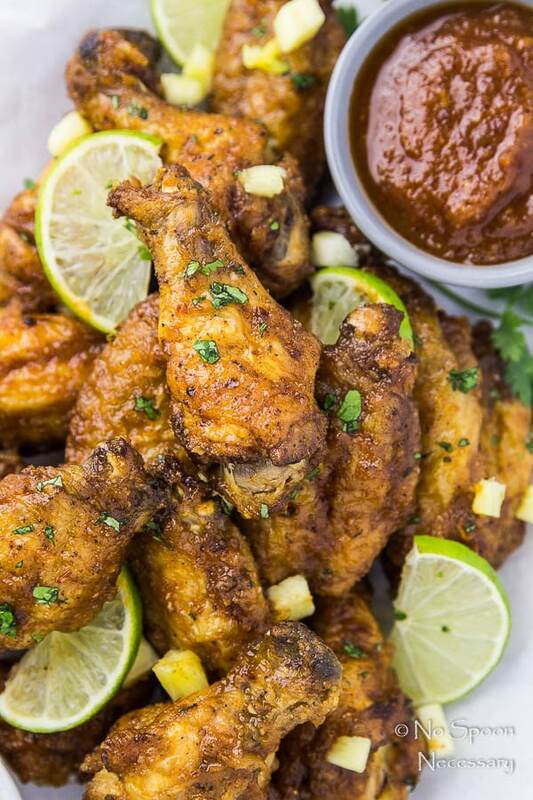 With half the fat, yet ALL the crispy, delicious flavor, these wings NEED to be part of your football line up! 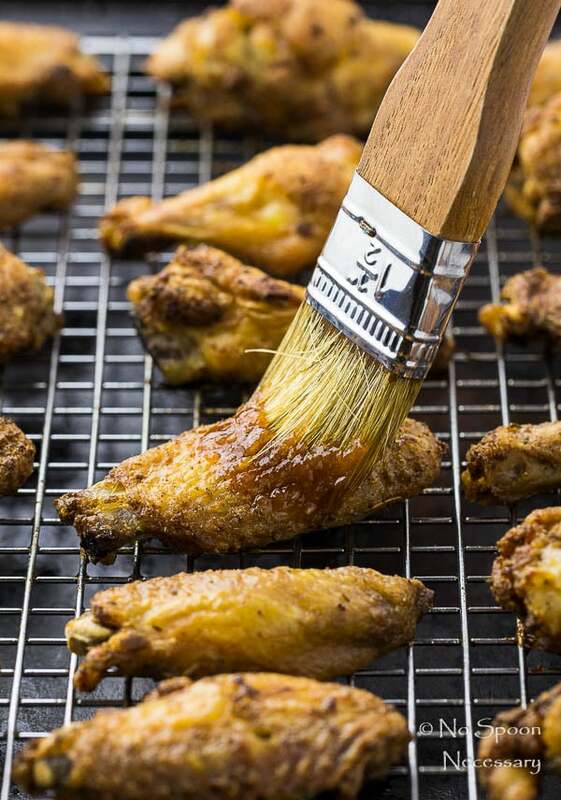 For the chicken wings: Use paper towels to pat chicken wings thoroughly dry. 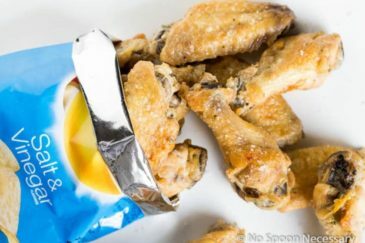 Place dried chicken wings in a large bowl or in a Ziploc bag. Add the cajun seasoning, baking powder and salt*. Toss or shake to evenly coat the wings. Adjust oven racks to upper and lower middle positions. 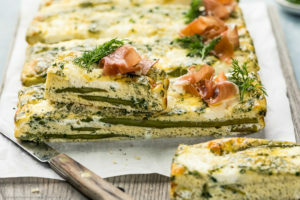 Preheat oven to 250 degrees F.
Line a large baking sheet with aluminum foil for easy clean up and insert a wire rack on top. Lightly spray rack with non-stick cooking spray. Lay wings, skin side up, on the rack in a single layer (It’s okay if they fit snugly). Transfer wings to the oven on the lower-middle rack and bake for 30 minutes. After 30 minutes, transfer the wings to the upper-middle rack and increase the temperature to 425 degrees F. Continue to bake for 40-50 minutes, rotating the pan halfway through cooking. 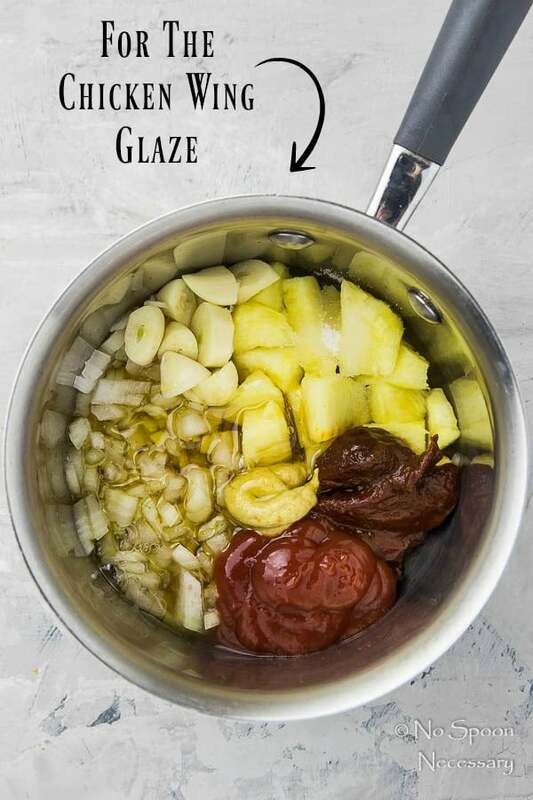 Meanwhile, make the glaze: Add all the ingredients for the sauce to a medium sized sauce pan. 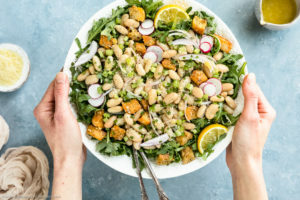 Season with ½ teaspoon salt and ¼ teaspoon pepper. Bring to a boil over medium-high heat, whisking frequently. Immediately reduce heat to simmer and cook for 10-12 minutes, or until sauce is slightly thickened. Use and immersion blender, or carefully transfer to a stand blender, and puree sauce. Taste and adjust for seasoning. Set aside until wings are done baking. 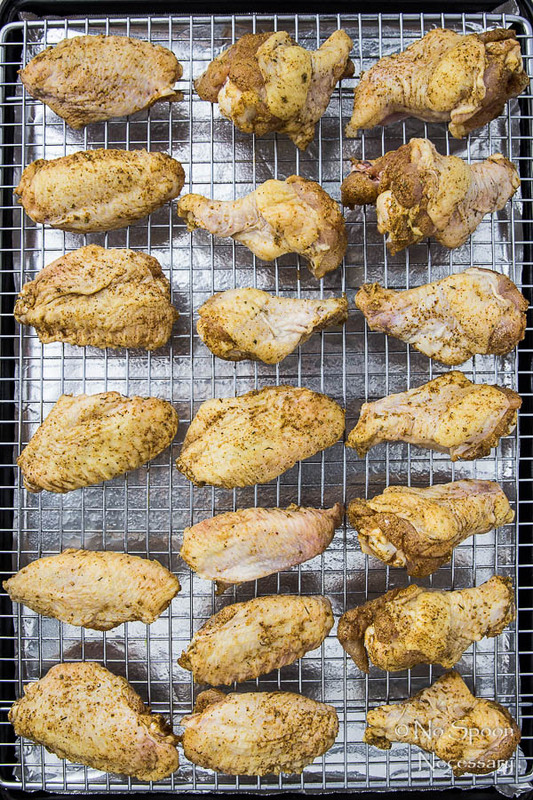 To Serve: When wings are done baking, remove baking sheet from oven and let wings stand for 5 minutes. Transfer wings to a large mixing bowl and toss with desired amount sauce. Serve wings with topped with optional garnishes and remaining sauce on side. Enjoy! 1. You can purchase your wings already cut into drumettes and flats, or you can cut them yourself. It’s really easy! Check out the picture at the beginning of this post to see exactly where to cut (you will discard the wing tip). OR you can make these leaving the wings completely intact – drumette, flat and wing tip all connected. 2. 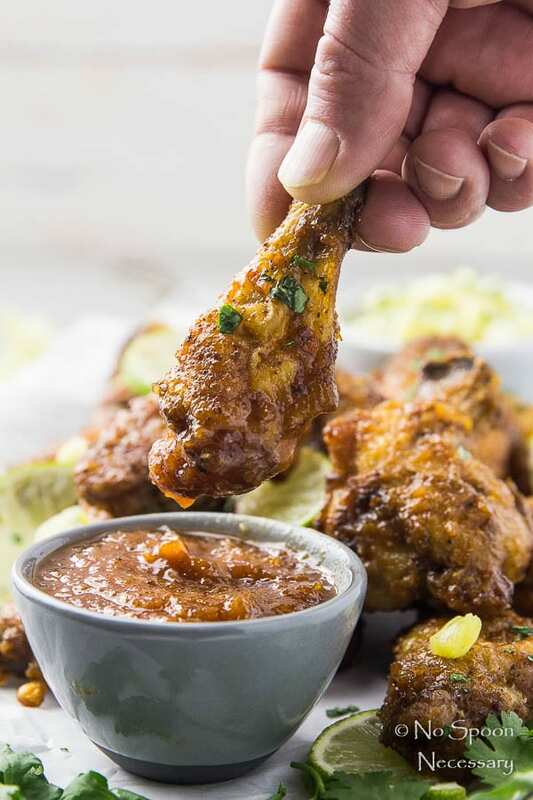 To ensure CRISPY wings, there are THREE steps you should NOT skip – drying the wings THOROUGHLY, coating them EVENLY in the seasoning/baking powder mixture, and baking them on a RACK insert. Do those three things and you are golden. 3. When baking the wings, do not be alarmed if there is a bit of smoke in the oven. Wings have a good amount of fat, and as these bake, the fat will be rendered out and create smoke. Don’t freak out. 4. You can either purchase Cajun seasoning or make your own. I highly recommend making your own spice mix. Not only is it really easy, you also probably already have all the spices in your cabinet. 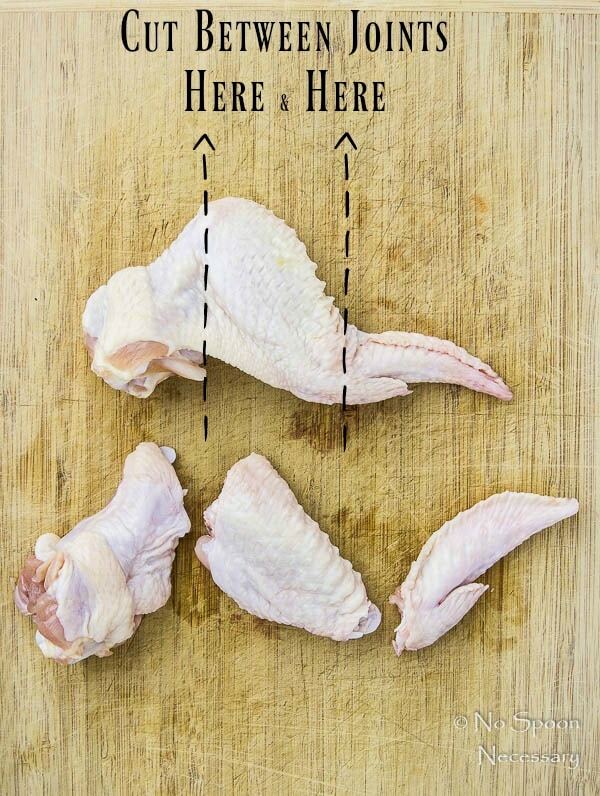 AND since you are controlling the amount of salt, you can skip adding salt to the wings in the first step. I have included the recipe to make your own Cajun seasoning below. IF you choose to buy your Cajun seasoning, TASTE IT. Use your discretion as to how much salt to add to the wings. 5. There are a few ways you can make the glaze. 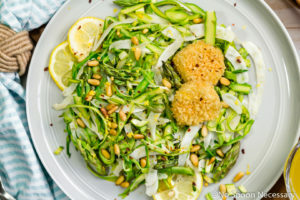 If you don’t have an immersion blender, but do have a food processor, I recommend you puree all the ingredients together in the processor first, and then cook the glaze. This way you can avoid transferring the glaze to a stand blender after it is cooked. If you do have an immersion blender, just follow the recipe as instructed. The same goes if you don’t have an immersion blender or a food processor, as you will just puree the glaze using a stand blender. 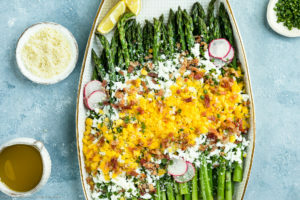 *You can substitute ½ cup of pineapple juice if desired for the pineapple. 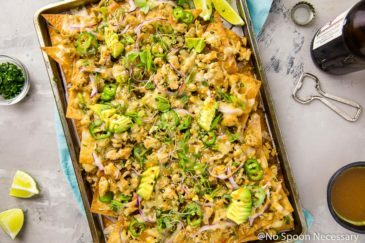 *You can substitute 1 ½ tsp Onion Powder for chopped onion. 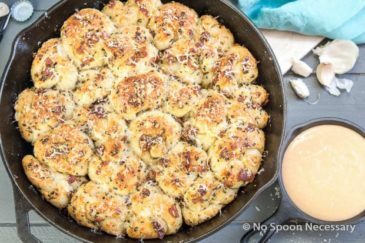 *You can substitute ½ tsp Garlic Powder for cloves of garlic.